Open a website, click on the webcam icon in the address bar and select Manage in the opened window. 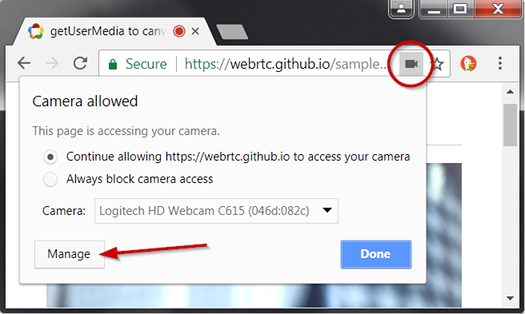 The camera icon only appears when a website is requesting access to your webcam. 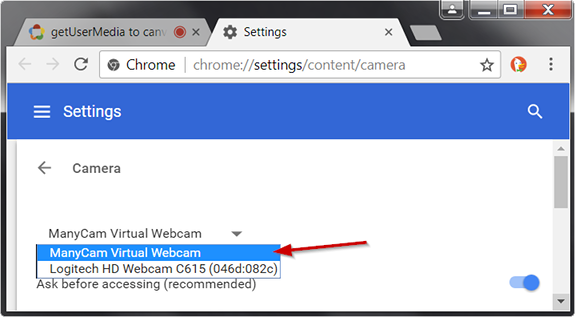 If you do not see this icon, you can select ManyCam Virtual Webcam in Chrome Settings manually.Click the Chrome menu button (top-right corner) -> Settings -> Advanced (at the bottom of the page) -> Privacy and Security -> Content settings -> Camera. Alternatively, copy-paste chrome://settings/content/camera to Chrome’s address bar. For more information about camera & microphone settings, please visit Google Help pages. In case ManyCam is not on the list, please refer to this guide.